Hello everyone! 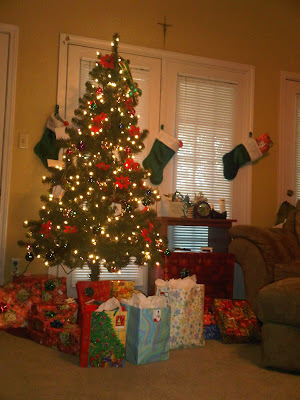 My Christmas was boring from midnight up to seven in the morning. I have all the reasons to get bored though. I was at work! LOL! Anyway, I had a wonderful Christmas celebration with my husband of course. Early morning, I open my giftSSSSSsssss...hehehe! Then, I gave his presents too. His two gifts did not arrive on time. I know he will love it! I took pictures of my gifts but, its in my blackberry phone. I do not have time to synchronize it in my PC. I sent some pictures to my email but, I get tired of sending it that way. For all those who visited my blogs, thank you. I appreciate it so much! Happy New Year to all! I just got home from work and I am having a wonderful time today. I gave simple gifts to my co-workers, eight of them in my department and glad they like it. When I arrived home, me and hubby open our gifts to each other. 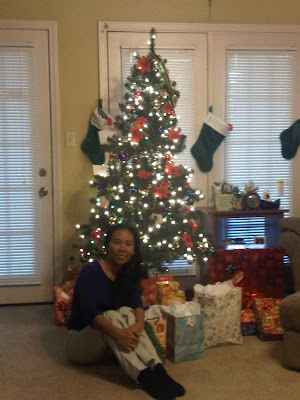 I guess I have 6 gifts from him including the Blackberry 9700. I gave him 3 but, the two electronics did not arrive by mail. I ordered it online. I gave him an XM Satellite Radio, He loves it dearly. Dad is asleep so, he will open his gifts later. How was your day so far? Great I know! We will have a family party at lunch time so, I will blog hop later. Merry Christmas to all! And I'll be there, yeah, yeah, yeah. And I'll be there, yes I will. Lord, I'll be there yes I will. Oh, you've got a friend. Aint it good to know you've got a friend. I know how to play guitar since elementary because I love to listen to music. My cousins who lived with us always play music on the radio and I get used to it. One day, they brought guitar and started a singing session. I just watched them play the guitar and I would sing with them too. When they are not using it, I tried to sneak around and play it with the help of a guitar chords guide. That was the start and strumming the guitar is just one of my hobbies as I grew up. The best way to learn guitar is constant practice. My husband saw my enthusiasm whenever I saw it on display. He first noticed it when we were in Hard Rock as I took pictures in all the display at the lobby. I was just delighted to see the real guitar of the famous artist like the Bee Gees. My husband bought me a new guitar as one of my Christmas presents. He told me in advance because he ordered it online and it is on the way for delivery. I was so excited knowing that I have an acoustic guitar soon. This Christmas gift reminds me of my happy childhood memories. Walmart is my favorite shopping store and I was waiting for a good deal of iPhone and I was able to find it here. With all my blogging opportunities, I was able to buy this gadget -----> an APPLE iPOD. I wish I bought this sooner. I was so impressed with this iPod. Yesterday, we attended a Christmas Party and it was our first visit to that house. I used the GPS on my iPOD and it works well. We found the house of our cousin with exact and clear maps. I LOVE IT! iPod touch is a great iPod, a great pocket computer, and a great portable game player. Listen to a mix of songs automatically put together just for you using the new Genius Mixes feature. Watch a movie or TV show on the brilliant 3.5" display. Surf the web, get rich HTML email, and update your social network profiles thanks to built-in Wi-Fi. Discover new games and apps easily with new Genius recommendations for apps. And since iPod touch now comes with the latest 3.1 software already installed, you can start using fun, convenient features right out of the box. I am a fan of Sharon Cuneta in fact when I was in High School, I became a President in a Sharon-Gabby Fan Club in Cagayan de Oro City under DXCL Station. Wheww! Those were the days that my inspiration in studies molded with music, Sharon Cuneta, Lea Salonga, Menudo and Walt Disney. I had a smile on my face right now reminiscing those moments of my life. I did reach out my dreams, not all yet but, the milestones of my life is good. Thanks to the music that inspired me. Today, I was browsing my Apple iPOD and I happen to listen to Charice Pempengco, a World Class Filipino talent. I was just blown away with the talent of Charice Pempengco. She sang Sharon Cuneta's Collection of music and I was very amazed with the arrangements. Her version was remarkable! The voice , oh well, just listen -----& WONDERFUL! If I will be blessed with a child, that baby will turn to be a singer, hehehe. Enjoy the music. If you do not understand, the melody will guide you through. After work, the road on the way home look like the pictures below. What time was these pictures taken? It's 7:35 in the morning in Biloxi and Ocean Springs, Mississippi. Yesterday, the rain was pouring hard with strong thunder. It was really scary when we were on the bridge because the lighting was bad. We can't see the Isle Casino or the Palace Casino from the foot of the bridge. Nearby places had a flood warning but thankfully, everything was alright. Morning comes, heavy fogs. Oh by the way, how bad was it last night? Pretty bad! You can't see the road because the rain will really blinded you. So, my husband decided that we will drive slow but, there were few cars zooming passed us. As if no mishap could happen to them. Unluckily, 1 car turn right and dive into the canal, probably miscalculated the turn. The canal was probably 3ft. high and I saw a person inside still, can't get out. I dialed 911 and my husband reported the incident to the dispatcher. We had no time to stop really. The traffic is heavy, rain is pouring hard and all we could do was call. In less than 3 minutes, we saw an ambulance and police cars rushing towards the area. The person was alright, we guess. The rescue was fast and by the time my husband drove back, the car was pulled from the canal already. The incident happened across the street of Ocean Springs Hospital anyway. Then 6 blocks away, another car submerged in the canal. There was nobody on it and we bet, the accident happened earlier. That was our enduring journey last night on my way to work. In the morning, wearing my Saints Jersey here (blurred), I enjoyed the fogs. Cold? Not at all! I wonder why it was not cold?HMMM. The pictures looks like night time, right? According to the forecast, in the afternoon there will be heavy rain and it did! Nasty Rain. This is a Sponsored Post written by me on behalf of Popstation. All opinions are 100% mine. I have exciting news to all the music lovers out there. Do you want to sing and become a recording star in the future? PopStation is a popular hang out for people who love to sing and have the drive to reach for stardom. It is an online music and entertainment singing experience for those who got the voice, the vibe, and the vote. You need the votes from your friends and family to be on the number one spot. If you are the lucky winner, you will be featured in the artist page and has the chance to get a Popstation Record Deal. Check out this Website because this might be your passport to stardom. Join and register for FREE. All you have to do is go to the practice rooms, enter the contest and pray to get votes from Popstation audience. Invite your friends to vote for you for a chance to win a VIP album recording experience. Win "The BIG Deal" and "The Artist Formerly Known as You" and experience a three-night stay in NYC with a luxury car service. The rest will be your dreams come true. For more information, click the links now. Today, my blackberry phone arrived via UPS and I was so thrilled like a baby. I was hoping to get an iPhone but my mobile carrier has none so, I choose the latest blackberry they've got and I did not regret it. "The first 3G-powered Blackberry smartphone that supports voice calls over Wi-Fi. Powerful and sophisticated, the Blackberry Bold 9700 has a high-gloss black finish, leather grain detail on the back, and chrome detailing. It supports 3G HSDPA around the world and is capable of global voice and data roaming in over 125 countries. The Blackberry Bold 9700 isn't just for business, this cell phone gives you access to the latest applications through the Blackberry App World and your favorite tunes from Amazon Mp3 Store. It offers a reliable and equipped mobile experience that is perfect for both personal and professional use."